Kerala PSC Sub Inspector of Police exam syllabus 2014 for August Executive branch PDF is given here. The Kerala PSC has taken all steps to conduct the Sub Inspector of Police (Category No: 253/2014 to 256/2014) exam. Candidates who wish to apply for the post should register as per 'One Time Registration' system on the Official Website of Kerala Public Service Commission 'www.keralapsc.gov.in'. The Kerala Public Service Commission has made all arrangements to conduct the Sub Inspector of Police Trainee (General Executive Branch) exam 2014. The tentative schedule of Inspector of Police (Category No: 253/2014 to 256/2014) examinations has also been announced. According to the notification from the PSC, the OMR test will be conducted on 2nd August 2014 while the physical efficiency test would take place between December 2014 and February 2015. Candidates who wish to apply for the post should register as per 'One Time Registration' system on the Official Website of Kerala Public Service Commission 'www.keralapsc.gov.in' before 16th July 2014. As entering the police force is the dream of many youngsters, it is very important to have a systematic preparation much before the examination. As both physical and mental are being tested, candidates should start working on it right away. The preliminarily test consists of an objective type exam (OMR Valuation) based on the qualification prescribed for the post. The syllabus of the Sub Inspector of Police exam 2014 will be the same as compared with the previous year. As there will not be a main exam, the upcoming test will be considered for the short listing process. 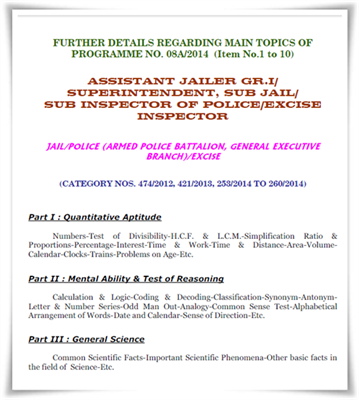 Here is the syllabus of the Sub Inspector of Police 2014 exam. As the exam is just near, an instant learning is needed from the part of the candidates who keep a burning desire to enter the Police service. A well knowledge about the portions indicated in the syllabus is well needed. Questions related to Renaissance in Kerala will also be a part of the syllabus. Much before the examination, candidates should take as many Mock Tests as possible. After the preliminary test, the the short list of selected candidates will be published in November 2014. During the months of December – January – February the physical tests for selected candidates would be conducted as per schedule. Those who pass the physical exams will be invited for the interview. After the decisive valuation, the final rank list will be prepared and published in the website by June 2015. Here is the detailed syllabus of the final examination of the Sub Inspector of Police (Trainee),conducted by Kerala PSC in November 2011. Company corporation assistant grade exam 2014 shortlist of Kerala PSC has been published. This is the short list/probability list of Junior Assistant/Cashier/Assistant Gr II statewide examination which was held on 8th June and 19th October 2013. The list is being prepared considering the candidates who have secured 62 Sixty two) marks and above are included in the Main List of the probability list. Those who got included in the probability list should produce the original and self attested copies. Kerala PSC Public Relations Officer (PRO) exam 2014 hall tickets category no (300/2011 & 301/2011) will be issued from 11th June. The exam is scheduled to be conducted on 2nd July 2014 Wednesday from 07.30 AM to 09.15 AM. Candidates those who had applied for the exam can download the hall tickets from the official website of Kerala PSC. The preliminarily test consists of an objective type exam (OMR Valuation) based on the qualification prescribed for the post. Kerala PSC one time registration (Thulasi) complete procedure and details about web portal http://thulasi.keralapsc.gov.in/thulasi/is given here. How to apply/login/register for Kerala PSC one time registration? This is one of the most common question asked by many job aspirants. Here you can find the complete solution about Kerala PSC one time registration. Kerala PSC notifications August 2014 to be published by the third week of June is expected to come up with 53 posts. The notifications include vacancies in Agriculture department, Civil Supplies Assistant Pharmist, Bender Grade II in various departments, Sub Inspector of Police, Excise Inspector etc.